It's always a pleasure to host Regan Black. I was introduced to Regan's books a few years ago and, wow, am I happy I was! Her action-packed stories, with heart-tugging romance and suspense that always keeps me guessing, never fail to take me on a heart-pounding ride. You can find more information about Regan and her books at her website and connect with her online at Facebook, Twitter, and Pinterest. 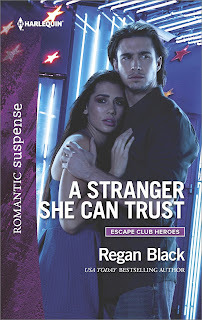 Regan joins us today to talk about the newest book in her Escape Club Heroes series, A Stranger She Can Trust. Once again, she captivated me with her characters, kept me guessing with intricately woven suspense, and crafted a story that refused to let go until I reached the final page. If you enjoy action and suspense within a satisfying romance, I highly recommend Regan Black's books. Please join me in giving her a warm Romance Dish welcome. 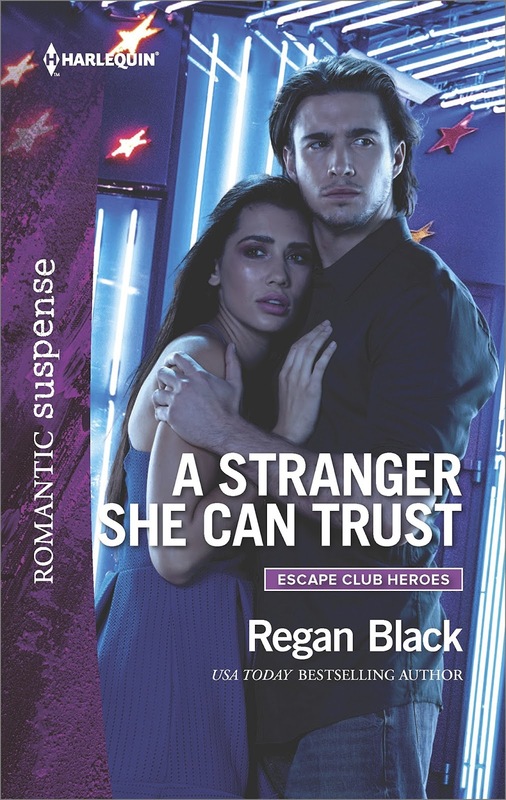 Thanks so much, PJ, for having me back today to celebrate the release of A Stranger She Can Trust, the second book in the Escape Club Heroes series. Writing these books for Harlequin Romantic Suspense has been a fabulous experience. to trust when we’re in the midst of a crisis. Melissa, suffering from trauma-induced amnesia has to rely only on intuition when she chooses to let Carson help her. One of my favorite scenes in the story takes place over the comforting power of chocolate cake. In the months after Carson was injured on the job, his oldest sister frequently stops by to check on him. On one such errand, she left the cake for him and he shares it with Melissa when she’s at a low point. Chocolate is one of those miracle cures for nearly everything, right? And I think cake can qualify as a helpful building block on the road to a happy ever after. The cake I used is a family favorite, rich, moist and practically mistake proof. Plus you can top it with anything or leave it plain. My mom called it Cockeyed Cake. I made this a few times while writing Carson and Melissa’s story - much to my husband’s delight. Preheat oven to 375°. Lightly grease an 8x8 inch baking pan with vegetable cooking spray or butter (or use a nonstick pan). Combine sugar, cocoa, flour and baking soda in a large mixing bowl. Add oil and water and blend thoroughly with a fork. Quickly stir in the vinegar. Pour into the prepared pan and bake for 25-30 minutes or until cake tests done. 9 servings. You can read the first chapter at Regan’s website: bit.ly/ECTrust or pick up your copy in ebook or paperback at Amazon | BN or your favorite bookseller! For a chance to win a $10 gift card and digital editions of both the Escape Club (series prequel) and Safe In His Sight (series book 1) leave a comment about your favorite dessert. Your chocolate cake sounds and looks so yummy! I'm partial to Cream Puffs, delicious whipped cream in a flakey pastry puff shell dusted with powdered sugar. Dk choc cake with choc ganache from Taste of Home. Chocolate on chocolate: nothing wrong with that! If it's chocolate, I'm all in! It's always a pleasure to host you, Regan. Loved the new book! My favorite dessert is fresh cream sherry trifle. I've never had that Diane, but the thought of it has me drooling. I've never had it either, Diane... googling... oh, yummmy! It's an English recipe that I make. It's very rich but absolutely delicious. My favorite dessert is a home made apple cake. My grandmother made a mouth-watering apple spice cake when we were kids. Sadly, she never wrote down the recipe or taught anybody how to make it so it was lost when she died. I have fond memories of that cake. I love chocolate filled with raspberry. Thanks for sharing about thee book & recipe Regan. For me, it's cherry and chocolate. It's a combo I can't resist. You're welcome, Carol! I enjoy chocolate raspberry, chocolate cherry and chocolate orange. One of my husband's favorite ways to top cockeyed cake is with cherry pie filling. When I crave a dessert it must have lemon. Lemon pie, cake, tarts and squares. My mom made the best lemon meringue pie I've ever tasted. I make a decent one but her pies were something special. My grandmother would make lemon squares for picnics during the summer - great (and tasty) memories! Thanks for visiting with us today, Regan! I really enjoyed Carson and Lissa's story. I don't eat a lot of desserts but one I can never turn down is Chocolate-Kahlua Mousse. I only make it when I'm entertaining or I'd eat the entire batch. It's that good. Whisk together pudding mix, milk, coffee, and Kahlua until thick. Chill. Before serving, fold in the whipped topping. Easy to make but so delicious! Oooo, that sounds fabulous, PJ. I'll have to try that the next time the kids are home to help us eat it. I don't indulge in it often, but my favorite dessert is Flourless Chocolate Cake served in a small puddle of Raspberry sauce with a finger of Whipped Cream on the side. That sounds delicious, Lil. Since I've had to go gluten-free, I've discovered the deliciousness that is flourless chocolate cake. Lil and PJ, I've heard of flourless choclate cake and my daughter has made it, but I've not had it. May have to ask my daughter to make it for me when she's home next time. Homemade cookies are nice - we make a coral cookie at Christmas - almond flavored thumbprints with grape jelly and nuts optional. 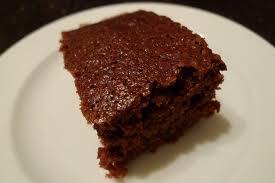 Love your recipe for Wacky Cake! a result of the resourcefulness of the WWII women with rationing. I love homemade brownies! the Fudgy ones. Thanks, Denise! I found a brownie recipe with a layer of caramel in the middle, and I adapted it for my sourdough brownies... yummmm. You can't go wrong with chocolate. Your cake sounds like one my mom made, only we called it the Wacky Cake. My favorite cake is German chocolate. Thanks for giving us a chance to win. This cake has all kinds of names - but it's always good. German chocolate was my dad's favorite, Trish. My favorite is chocolate fudge cake with homemade cream cheese icing. It has become my husbands also so I will be making it for his birthday later this month. Mouth is watering. Thanks for the chance! We called that a Jiffy Cake and frosted it - yum! My favorite cake is a Devil's Food cake with a Boiled white frosting (which is like a combo merinque/marshmallow). My mother makes a Port Wine Trifle that is to die for. Oh, that sounds decadent, Mary! Apple pie a la mode is my weakness! I can't help having a slice if it's on the dessert menu! I've copied your recipe to my file. Love how easy it looks to make, plus all ingredients already on hand. Bonus! Beat cake mix, dry pudding mix, water, eggs, and oil in large bowl with electric mixer on low speed until blended. Beat on high speed 2 minutes. Gently stir in apples. Pour into a greased and floured 12-cup fluted Bundt pan (ensuring that the middle “hole” is also sprayed and floured) or a 10” tube pan. Bake in 350F (180C) preheated oven for 50 minutes to 1 hour (mine takes 54 minutes), or until toothpick inserted in centre comes out clean. Cool 20 minutes. Remove from pan. Cool completely on wire rack. Microwave caramels and milk in microwave-safe bowl on High for up to 2½ minutes, stirring every 30 seconds, until blended. Cool 10 minutes until slightly thickened. Drizzle over cake. Makes 16 servings. Preparation time: 15 minutes. Ready in: 1 hr 35 minutes. * Place caramels in freezer for 5 minutes before unwrapping, as the plastic will peel off in a cinch! * Serve topped with thawed Cool Whip or vanilla ice cream as a treat. * Kraft customers have said to use butter pecan cake mix and butterscotch pudding instead, as “to die for”. * Tip: For leftover cake, stab a bread crust with a toothpick to the open edges so that bread gets stale instead. * Per serving (1/16th cake): 275 calories, 10.5 g total fat, 342 mg sodium, 42.7 g carbohydrates, 1 g dietary fibre, 3.6 g protein, 2%RDI Vitamin A, 2%RDI Vitamin C, 6%RDI calcium, 5%RDI iron. For those who don't mind a bit of alcohol in their cooking these are perfect. I have used this recipe for over 40 years and my children continue the "tradition." I generally only make them around the Holidays. They are too much of a temptation. Luckily, they do keep well in an airtight tin and keep their "kick." Melt chocolate in a double boiler (over hot water). In a large bowl, combine crumbs, sugar, and nuts. Pour the melted chocolate mixture over it and mix well. Drop by small amount (about a rounded teaspoonful) into additional powdered sugar and roll into balls. Place on a tray and let stand in refrigerator for a couple of hours. When well chilled, roll in powdered sugar again to coat well. Seal in an airtight tin.